Washington Local 26's Kenneth Davis (standing at right) talks to a Building Futures class about his own success with the program. Washington Local 26's Kenneth Davis found work shortly after completing the Building Futures program. Kenneth Davis is one such individual who found help — and success — landing good union-represented work, thanks in part to the Metropolitan Washington AFL-CIO Council’s Building Futures program, which offers free training and certification to ex-offenders, military veterans and low-income men and women interested in pursuing a career in the building trades. 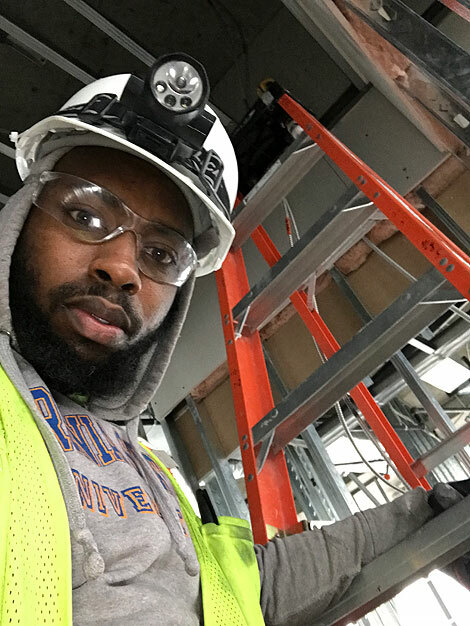 “It’s a great program for people who don’t know anything about construction,” said Davis, a D.C.-area native and former prison inmate who is now a residential wireman apprentice at Washington Local 26. Davis, who spoke about his positive experiences with the program to a recent Building Futures class, said he already had an interest in electrical work when a friend talked to him about the program. For nearly 10 years, Building Futures has worked to train, certify and place participants in the electrical and construction industry in Washington and in the city’s close-in Maryland and Virginia suburbs. Building Futures instructors cover a wide variety of topics from construction math to blueprint reading to job readiness, and they work with building and construction industry leaders to help graduates gain apprenticeships and entry-level positions. Course participants also can earn certifications in areas such as flagger safety and OSHA compliance. They are coached on how to write effective resumes and how to conduct themselves during job interviews, and they visit job sites and hear from representatives of a number of construction trade organizations and unions. A 2014 Arizona State University survey of hiring managers showed that job applicants with criminal histories tend to be among the least likely to be hired, but more recent studies by Northwestern University and Johns Hopkins Hospital separately found evidence suggesting that ex-offenders tend to stay employed longer than their record-free counterparts. Research by the conservative Manhattan Institute think tank showed the benefits of steady work to former inmates, determining that the sooner ex-offenders found work, the lower the likelihood that they might wind up doing something that landed them back in jail. The 30-year-old Davis graduated from Building Futures in December of 2016; within two weeks, an opportunity opened up for him to join Local 26 as a residential class apprentice and to work on a new mixed-use commercial/residential project on southwest Washington’s waterfront. More recently, Davis has been working with an electrical contractor on a new 31-story office building in nearby Tysons Corner, Va. The free, six-week Building Futures program, offered four times a year, is open to qualified candidates who have either a high school or general equivalency diploma. Program organizers say it has an 80-percent placement rate. “Participants like Kenneth succeed because of their own drive and the intensive case management they receive in Building Futures,” said the AFL-CIO’s Sonte DuCote. This program is made possible largely through funds provided by the Department of Labor’s Green Jobs Innovation Fund and other local supporters. Visit communityservicesagency.org to learn more.